Home to around 60,000, Great Falls resides along the Missouri River in Cascade County, Montana. I-315 provides a fast connection to the commercial strip along 10th Avenue South through the city. Interstate 315 spurs east from I-15 by Great Falls Market Place shopping center to Country Club Boulevard at 6th Street SW. Totaling just 0.828 miles per the 2013 MDT Route log, I-315 is only slightly longer than the shortest Interstate highway, unsigned Interstate 878 near John F. Kennedy International Airport in New York City. Signs for Exit 278 along Interstate 15 reference Business Loop I-15, U.S. 89 and Montana 200. I-315 is omitted due to the number of overlapped routes. Montana 3 is also routed along the freeway, but equally unsigned. 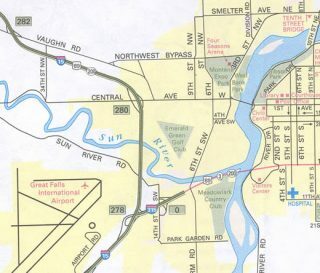 The Great Falls Business Loop for Interstate 15 loops east via U.S. 89 and MT 200 along Country Club Boulevard and 10th Avenue South to 5th Street south and 6th Street north. The I-315 portion passes over both 14th Street SW and a BNSF Railroad. An 11-block couplet takes the business route north 0.8 miles from U.S. 89 & MT 3-200 (10th Avenue South) to 1st Avenue North and the central business district. 1st Avenue west across the Missouri River to Central Avenue returns Business Loop I-15 solo to I-15 at Exit 280. Montana 3 begins along side Interstate 315 from I-15. The state highway connects Great Falls with Billings, and it is cosigned with U.S. 89 & Montana 200, U.S. 87, U.S. 191 and U.S. 12. The only section of Montana 3 that is not cosigned with another route is the segment between Lavina (U.S. 12) and Billings (Interstate 90 – Exit 450). The extended Montana 3 was commissioned around 2000; originally it only traveled between Lavina and Billings. 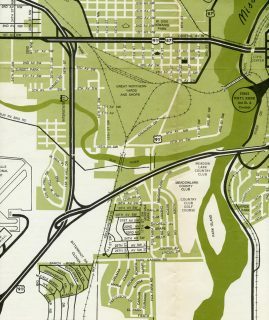 A contract to build a 0.6 mile section of Interstate 315 was completed by September 15, 1967.1 The lone interchange (Exit 0) at 14th Street SW was added in 1995. 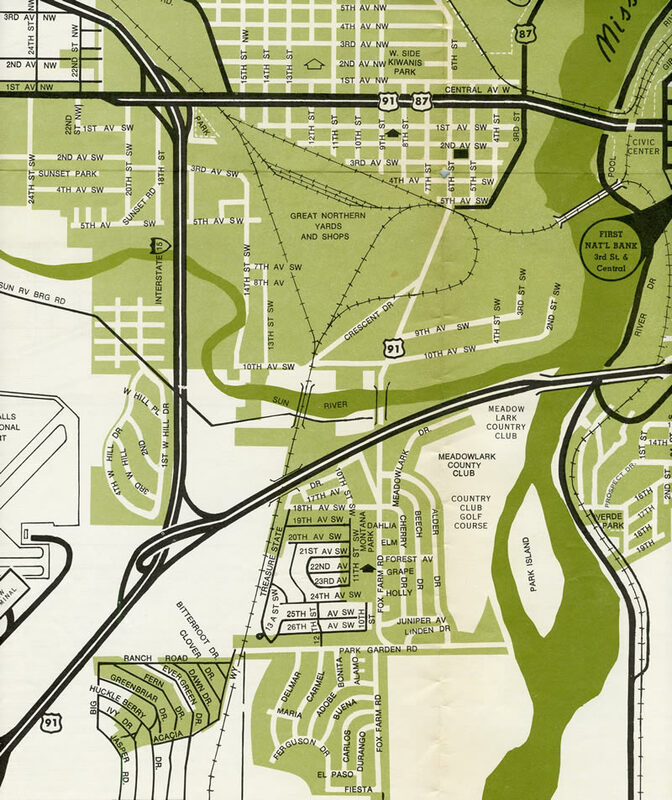 1968 map of Great Falls showing the unmarked spur for I-315 doubling as U.S. 91. Great Falls was also served by a Bypass branch of U.S. 87 at the time. Unsigned Interstate 315 on the Great Falls inset of the 2003 Montana Official Map. Business Loop I-15 follows the couplet of 5th and 6th Street between U.S. 89 and 1st Avenue. The speed limit reduces to 45 miles per hour as the I-315 freeway transitions to Country Club Boulevard. Business Loop I-15, U.S. 89 & MT 3-200 advance another 1.8 miles to 6th Street South in Great Falls. Photo taken 07/07/16. 6th Street SW angles northeast across the Sun River to the Jewel Addition area of Great Falls. Fox Farm Road extends south from the signalized intersection to Montana Addition and other subdivisions. A controlled access section of Business Loop I-15 ensues from the traffic light to 4th Street South. Photo taken 07/07/16. Country Club Road parallels the Sun River from the Missouri River bridge west to the traffic light with 6th Street SW north and Fox Farm Road west. I-315 begins a short distance after this intersection. Photo taken 07/07/16. I-315 begins at the folded diamond interchange (Exit 0) with 14th Street SW. The concrete median on the approach is similar to the one at the westbound beginning of I-115. Photo taken 07/07/16. The last confirming markers for both Business Loop I-15 south & Montana 3 precede the off-ramp (Exit 0) to 14th Street SW. Great Falls Market Place, a big box retail center, lies just to the south. Photo taken by Jeff Royston (07/17/07). Traffic partitions to Interstate 15 north and south a short distance west of the 14th Street SW on-ramp. U.S. 89 north & Montana 200 west combine with I-15 north for an 11-mile overlap to Vaughn. Shelby, located at the cross roads with U.S. 2, is 85 miles to the northwest. Photo taken 07/07/16. I-315 & Montana 3 west end as the freeway mainline defaults onto I-15 south to Great Falls International Airport (GTF) and the capital city of Helena. Photo taken 07/07/16. This set of signs for Interstate 15, U.S. 89 and Montana 200 at the south end of Business Loop I-15 was replaced by 2015. Photo taken by Jeff Royston (07/17/07). Leading away from Great Falls International Airport (GTF), Interstate 15 approaches the trumpet interchange (Exit 278) with unsigned I-315, Business Loop I-15 north, U.S. 89 south & Montana 3-200 east. Photo taken 07/07/16. Drivers along I-15 north reach the off-ramp for I-315. Beyond the Missouri River bridge and viaduct, U.S. 89 & Montana 2-300 transition to 10th Avenue. U.S. 87 combines with the trio at 15th Street southeast to Malmstrom A.F.B. and Belt. Photo taken 07/07/16. Interstate 15, U.S. 89 & Montana 200 turn south from the split with Business Loop I-15 to cross the Sun River and next meet unsigned Interstate 315 (Exit 278). Montana 200 is part of multi-state route extending east from Idaho to Minnesota across the northern tier of the United States roughly parallel to U.S. 2. Photo taken 07/07/16. A trumpet interchange (Exit 278) returns Business Loop I-15 south from 10th Avenue South and Country Club Boulevard to I-15 in one quarter mile. Although unsigned here, Montana 3 also begins. The state highway was designated to connect Great Falls with Billings on a consistently numbered route. Photo taken 07/07/16. Exit 278 takes U.S. 89 south & Montana 200 east from I-15 south to combine with Business Loop I-15 eastward to 10th Avenue South. U.S. 89 used to travel from Mexico to Canada; today it travels from Flagstaff, Arizona, north to the international border north of Babb, Montana. Photo taken 07/07/16. Traffic from I-15 north and south combines just ahead of this shield assembly featuring the first shield for MT 3. A loop ramp (Exit 0) quickly follows for 14th Street SW. Photo taken by James Horton (03/29/03). Montana Highway Department. (1965). The Center line: Montana Highway Commission. Helena, MT.